So up until this point I had been despairing of a good free screen capture tool. There are several of them out there (including the infamous WinSnap – was free and then sadly went shareware), but what I really need is the ability to annotate your screen captures. When putting together technical how-to documents with screenshots, you want to be able to circle the button that should be clicked, or draw an arrow to a particular object of interest in the capture. Or add a border, or dropshadow, etc etc. 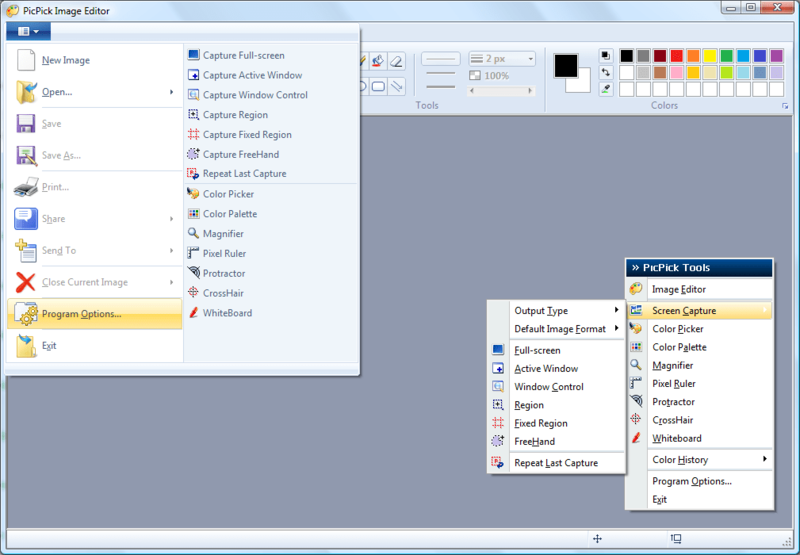 Now, you can put your capture into Microsoft Word and then use its drawing tools. But that’s not great for quickly emailing something to someone. At work, we have licenses for SnagIt, but what about the poor masses out there? Best thing I’d see to this point was FastStone Capture, but it’s shareware and my thirty days of joy and delight with it were up all too quickly. Then I discovered PicPick. It’s everything I’ve ever wanted in this type of tool. The amount of features it has blew me away when I first saw it – not only do you have the regular screencapture tools (including rectangular area, window [with vertical scroll support, so you can for example capture tall webpages etc], freehand area, full screen) and border/dropshadow frame effects, but you also have fantastic extended features such as “whiteboard” mode – allows you to draw on the screen so that you can make your presentations or tech sessions a lot cooler, a “protractor” mode so you can measure the angle of something on the screen, no idea why you’d want to do that but hey, it’s a free program! – and even a color picker and palette mode which helps when you’re coding eg. CSS and want to grab a color from the screen to match to a border or font or whatever. I was going to make a criticism about how it has those horrible Vista-style ribbon menus, but then I noticed that there’s an option in there to turn them off completely and go to classic menu mode. Hooray! The only problem I’ve found with it that kept it from getting one of my esteemed “hot download awards” is the fact that the autoscrolling window capture mode doesn’t appear to work with Firefox. Works with Chrome, works with IE. Hopefully it’ll get fixed though, and it’s pretty far from a dealbreaker for me anyway. Get this program. It’s terrific. Edit 20100725: Now warrants a Hot Download award! Stickies has to be one of my most-used applications over the last year or so. I have it installed at work and my wife and I have it at home too. Essentially it works like an electronic post-it note pad. 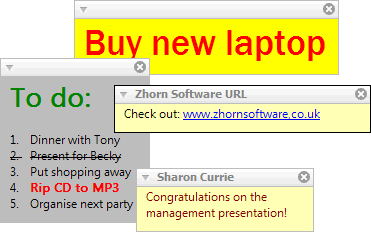 You can click on the systray icon and pop a blank “note” window on your screen. At this stage you can enter any text you like – hyperlinks are automatically recognised and the note also supports rich text and even working “checkboxes” so you can make a mini to-do list (I suggested this feature :). The underlying functionality is fantastic, too. It is network-aware, to the extent that I can write a note at work and then send it to pop up on the screen of my PC at home. The wife and I use it to “chat” with each other, usually to send links or “dinner’s ready” alerts, as her PC is downstairs and mine is upstairs. 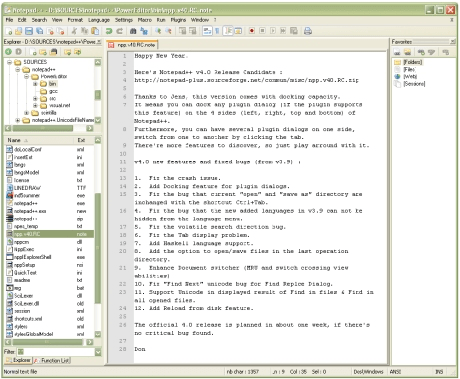 Stickies is visually customizable too – the colour of notes can be changed and you can also use “skins” – many skins are available from the author’s website. Other features include a “manage stickies” mode – you can see all the stickies you’ve closed, search for text in a sticky, and store stickies permanently in one or more categories; you can “attach” a sticky to a window on your screen so that whenever that window opens the sticky will open as well (I have this at work so that whenever I open my electronic timecard a sticky containing a list of the timecard categories appears so I can remember which category to use for any given project); you can set an alarm on a sticky and then send it to sleep, so that when the time/date rolls round the sticky will appear and then madly jiggle about on the screen to attract your attention (I use this a LOT) and even more features that I haven’t even used yet. Summing up, this is an absolutely indispensable tool that nobody should be without. Very small system resource footprint. Best of all, it’s completely free. Honourable mention: TurboNote – another great utility in the same vein, but slightly more bloated and not free.